Can you give us a little introduction to Sturgis Buffalo Chip? The owner, Woody, would say… in 1981 we found a patch of grass outside of town, chased the cows out, invited a bunch of friends, got a few kegs of beer, and had somebody sing a song. And that was how the party started. It grew from there. In 36 years the Sturgis Buffalo Chip has gone from party in a pasture to the Largest Music Festival in Motorcycling. The motorcycles give The Chip a bit of a different flavor than any other festival. If you are running empty on life experiences, want to discover new artists, relish in the old, pick up a motorcycle and go for a ride or just create stories with friends that boredom will envy, you can certainly fuel up your life here. The Sturgis Buffalo Chip has concerts, races, art exhibits, bike shows, and a slew of activities and entertainment that I could go on about, but the 2016 Sturgis Buffalo Chip Aftermovie does a better job of summing it up. Out of all the places to hold a motorcycle rally, why Sturgis, South Dakota? It’s a beautiful place. The Black Hills provides for some of the most scenic recreational and riding areas in the United States. Mt. Rushmore, Crazy Horse, The Needles, Bear Butte are all right around the corner. That said, the location really wasn’t chosen. It chose us. The Sturgis Motorcycle Rally started prior to WWII when local Indian Motorcycle dealer Pappy Hoel invited people to watch him and nine of his buddies race. They had picnics and Pappy made a spectacle of crashing through a wall of flaming pine boards on his motorcycle. It became an annual gathering that grew. People needed a place to feel welcome, gather, and have a good time, so the Legendary Buffalo Chip was born four miles outside of town. Submit your song to play Sturgis Buffalo Chip today before time runs out! Can you give us a glimpse of what the Sturgis Buffalo Chip audience is like? From a performer’s perspective there’s this unique experience where the audience revs their engines if they like an artist or song. You can probably imagine the memorable impression that could leave on bands. They eat it up. It’s powerful and invigorating. When the Japanese band, MMS, performed, the singer kept yelling for the audience to, “Make Motorcycle Sound! Make Motorcycle Sound!” We subsequently decided that Make Motorcycle Sound must be what MMS stands for. On a personal level, the audience is made up of some of the friendliest people you ever will meet. And that’s no joke. That is especially true because the Chip audience comes together from all over the world, 28 countries and all 50 states, for one reason: to have a good time. That’s why the Chip is also known as The Best Party Anywhere. It’s the people who make it so. Bands make new friends and loyal fans that end up supporting them for a long time. Especially if they are as dedicated to letting loose and having fun as the fans. You also never know who might be in the audience. Many bands have gotten opportunities to perform overseas, get tours with headliners, or get featured on TV because of their performances at the Chip. For 36 years, motorcycle aficionados have been coming together for two weeks of motorcycles, music, freedom and camaraderie. How has the community and music evolved since its inception? Tastes have diversified. The sense of freedom and revelry with friends has not. These days you’ll find a full gamut of musical appreciations and cross genre entertainment at the Chip. You’ll find solid support for the traditional sounds of heritage bands like Lynyrd Skynyrd and Willie Nelson, hard rock like Godsmack, Shinedown and Five Finger Death Punch, country rock like Zac Brown Band and Brantley Gilbert and emerging artists like Reverbnation’s Midnight Mob, Low Volts, and the Grizzled Mighty. There is also a retro revival movement going on that we are supporting in order to bring back the youthful excitement of the old school street drag and flat track racing that inspired a generation to go out and have some fun on motorcycles. Because of the strong community interest, the Chip has tied together multiple days of concerts and races into what is being called our MotoStampede event series. This leads to a pretty unique festival experience for artists and fans to social media home to their friends about. 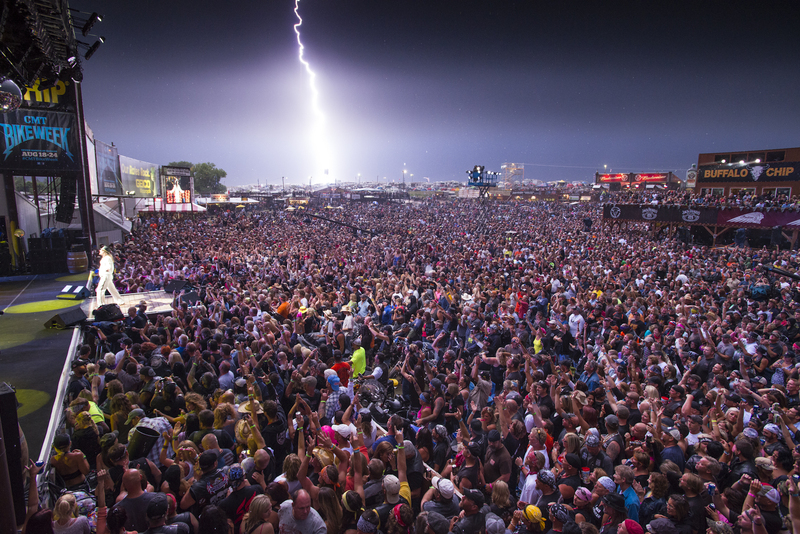 What would you say is the “need-to-know” information for emerging bands coming to Sturgis for their first time? Having a unique sound is an obvious necessity, but as much as some original artists seem to scoff at the idea, having a few good covers in your arsenal is something that will help with your popularity at festivals. You’ll find that being able to perform a few covers helps warm up an unfamiliar crowd and makes you a more versatile artist. Knowing a few covers can help round out or fill up a longer set. This makes your band more attractive. In our case, set times can be up to 90 minutes long. Also, try to perform more than one night. This allows fans the opportunity to tell their friends about you and bring them to your next performance. What are some general tips and advice for bands staying at the campgrounds? Do read the Essentials Guide, visit the website and do your research. Do be flexible, dynamic and have a good attitude, and you’ll have fun. Things can and will change daily with little advance notice, including the weather and schedules. Do come expecting to discover the unexpected. There are no words that can put the festival into true perspective. Any descriptions you’ve heard will not do it justice. There is only one way to truly understand it, and that’s by experiencing it. Don’t mistake the gig for a club gig. The festival has most of the basic amenities of a city, but it’s not Manhattan. You will get dirt on you. It will stick to your sweat. And you will have some distances to cover on foot to see and experience all the activities and other bands. Don’t be afraid. It’s a fun party with a lot of respectful people who may become friends of yours for life. Last year, eight ReverbNation bands were selected to perform! Can you tell us about a band that stood out to you? Midnight Mob stood out as a high-energy original rock ‘n’ roll band with an attitude that we loved, fans loved, and most importantly, rocked the wax right out of our ears.